2 binders (blackline masters) form the foundation of this learning resource series. Ready-to-use grammar activities at your fingertips that will free you to use your valuable time, energy and creativity implementing your program in all areas of language. Fun and engaging activities and exercises to reinforce the grammar basics. 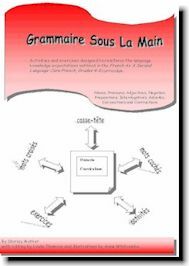 All activities are referenced to reinforce the grammar expectations outlined in the Ontario Curriculum, French As A Second Language: Core French, Grades 4 - 8, 1998. Although organized by grade level the activities may be used by any level from grade 4-8 depending on the students' needs. Use for current student work as well as for reviewing expectations from previous grades. 69 activity pages, easy to pull out and ready to copy. A variety of learning activities including mots cachés, casse tête, exercices, and mots croisés. All activities are arranged and outlined in a useful table of contents according to grade level. 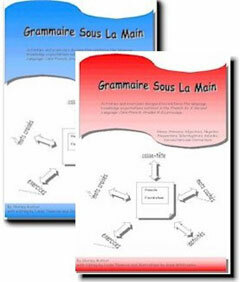 All activities are referenced to reinforce the grammar expectations outlined in the French As A Second Language: Core French, Grades 4 - 8,1998 curriculum. For curriculum connections, click here. 74 activity pages, easy to pull out and ready to copy. Activity pages specifically designed to reinforce student learning of nouns, pronouns, adjectives, negation, prepositions, interrogatives, adverbs, conjunctions and contractions. This is a more economical way to purchase both of the above binders. If you would prefer to print off and mail an order form to LearningSpirit, click here.